On Tuesday afternoon, Grassroots groups and the Democratic Party of Wisconsin will unveil their signature haul in the effort to recall Gov. Scott Walker and Lt. Gov. Rebecca Kleefisch. They need at least 540,208 signatures to trigger recall elections for Walker and Kleefsich, but it’s clear they’ve easily surpassed that mark. So where will Walker be when the final signature tally is announced? In the state capital or the governor’s mansion, standing his ground and defending his record? Nope. He’ll be in New York City at the world headquarters of the megabank Citigroup raising money for his recall defense effort. 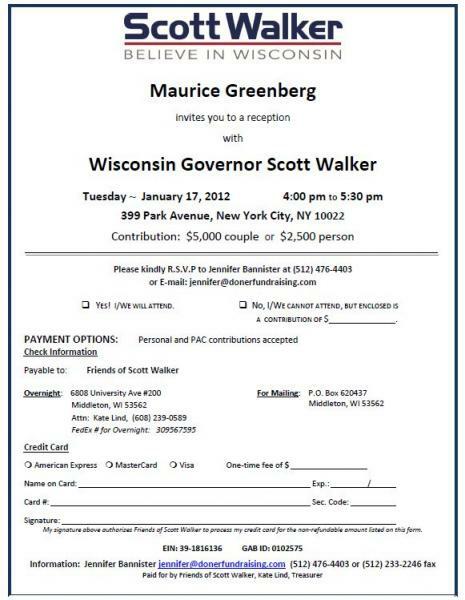 Tuesday’s Walker fundraiser, first reported by the New York Daily News, is hosted by no less than Hank Greenberg, the former CEO of American International Group, the global insurance corporation that needed $150 billion in bailout funds in 2008 and 2009 from the Treasury Department and Federal Reserve. The cost of attending is $2,500 per person or $5,000 per couple. Thanks to a loophole in Wisconsin elections law, Walker can raise unlimited amounts of money to defend himself in a recall election (the typical limit for gubernatorial races is $10,000). Brad Courtney, chair of the Republican Party of Wisconsin, admitted last fall that raking in unlimited donations was central to Walker and the Republicans’ defense strategy, according to audio obtained by Mother Jones. Walker began fundraising in November, and has until “a recall primary or election is ordered, or after that time if incurred in contesting or defending the order” to raise unlimited donations. In other words, Walker’s unlimited fundraising window could extend well into next month. Walker raised $5.1 million dollars between July 1 and December 10, a period that includes his recall fundraising. Out-of-state donors accounted for almost half of that money, according to campaign finance records. The biggest donor to Walker’s recall defense is Bob Perry, the Texas homebuilding magnate and who bankrolled the infamous Swift Boat Veterans for Truth campaign that caused trouble for Sen. John Kerry’s 2004 presidential bid. Perry gave $250,000 to Walker. Other top Walker backers are Richard and Elizabeth Uihlein, who own the Uline shipping company and chipped in $205,000, and Foster Friess, a Wyoming-based investor and frequent GOP donor, who donated $100,000.